FIA GP2 Races 1 & 2, 20th/21st November 2015 Bahrain. Series rookie Dean Stoneman made further progress during two strong performances in Bahrain for the Carlin team as he adapted life in the F1 feeder series. 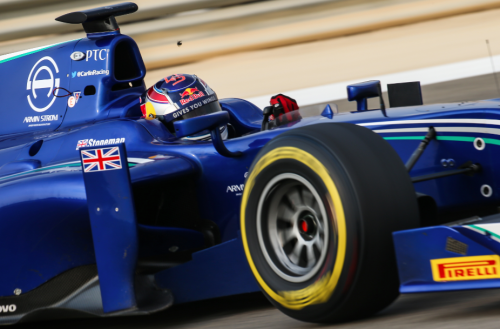 The Red Bull Junior arrived at Bahrain for the first time eager to build on a solid debut in Sochi where he picked up points in his first outing in the Carlin car. For the first race Stoneman can consider himself very unlucky not to have finished with more. The 25 year old made a stunning start making up five places only to be hit and spun from behind at turn eleven by former World Series rival Oliver Roland. Roland was to apologise after the race, but this didn’t lesser the frustration for Stoneman who battled his way back to finish 21st. The result was certainly not representative of his impressive race pace at a circuit he had never raced at previously. Starting from 21st on the grid for race two, Stoneman again got a great start and stayed out of trouble in an incident packed first lap. From there, the Red Bull Junior steadily picked his way through the field overtaking many established GP2 drivers to bring home his Dallara in an impressive12th place.